A new school year means a fresh start, a chance to venture out and find new interests. The new school year also means change- a term that is often feared because of the uncertainty it brings. So what exactly is this change? It is “Warrior Block”. Warrior Block is a new concept for Weddington, but not for Union County. Many surrounding schools have incorporated an additional block into their daily school schedule. 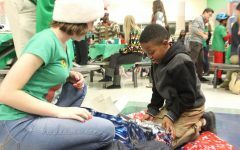 The purpose behind Warrior Block is to provide time for students to further their enrichment. 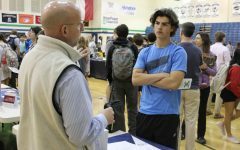 The Principal of Weddington High School, Dr. Jay Jones, says, “[An] objective of Warrior Block is to provide students who are meeting certain academic benchmarks and expectations with some choice opportunities during the school day such as silent study hall, collaborative study club, student club work, and/or physical activity.” Providing the time during the school day takes less time away from extracurriculars, and allows teachers and students to meet on an easier basis, solving the problem of before and after school hour transportation, which limited many students from both receiving help and meeting with respective clubs. Dr. Jones believes, “building the enrichment/remediation time into the school day allows us to reach more students more consistently, thus increasing our chances to meet the needs of every student”. Although Warrior Block will adjust the previous schedule, students will still have four blocks per day with lunch in between. 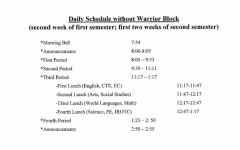 Here is what the schedule will look like according to Dr. Jones, “On Mondays during Warrior Block, students will report to their first period class. On Tuesdays during Warrior Block, students will report to their second period class. On Wednesdays, students will report to their third period class. On Thursdays, students will report to their fourth period class. We will utilize a rotation on Fridays. So, in week 1 of Warrior Block, students will report to their first period class on Friday. In week 2 of Warrior Block, students will report to their second period class on Friday.” In addition to that, classes will be shortened for Warrior Block. Dr. Jones addressed this aspect when he mentions, “Those [couple of] minutes have been re-purposed in order to provide a time focused on something that we can improve upon at WHS, which is providing remediation to students who are struggling and enrichment to students who would benefit from being challenged at a greater level”. Within Warrior Block’s thirty minutes many opportunities are available, all to the student’s benefit. However, some prerequisites that follow. Students with below a 90% for the Warrior Block class on the given day, and/or have missing assignments for that class, will be required to attend that Warrior Block class. 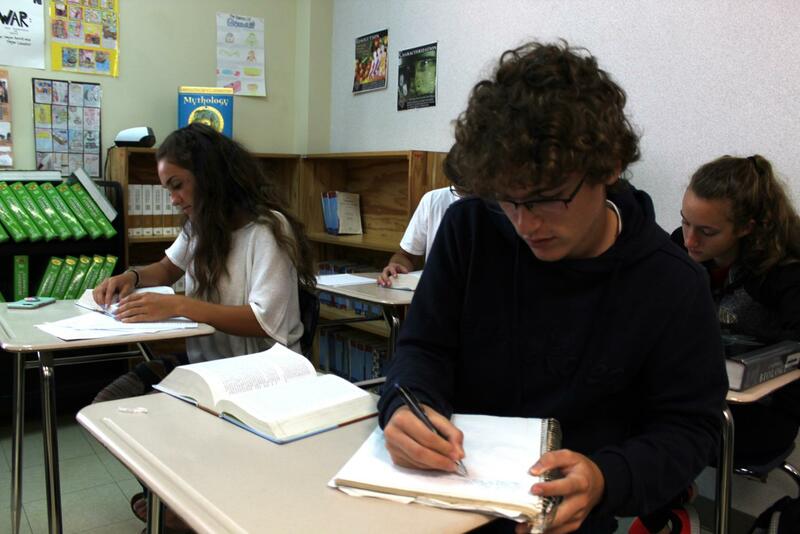 If a student has a 90% or above and has no missing assignments, the student will be given the opportunity to attend silent study hall in the media center, collaborative study hall and club functions in the cafeteria (club functions will be near the windows), or gym/track time in the main gym, auxiliary gym, and track. 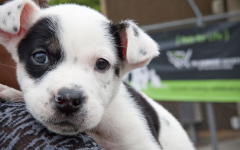 While Warrior Block’s purpose and ultimate goal is to benefit students, there are some implications. The administrative staff, Deputy Byrum, the P.E. 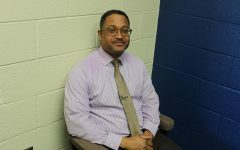 faculty, and Mr. Louis are working meticulously on the regulation and monitoring of the students, but have the confidence and trust to allocate for extra freedom and growth. When asked what he hopes Warrior Block will accomplish for Weddington High School, Dr. Jay Jones replies, “We aim to utilize Warrior Block to push ALL of our students to their full potential. We shouldn’t be satisfied with the status quo. We shouldn’t be satisfied that [we] have several students who are performing well but who could be performing better. Moreover, we see an opportunity to provide many of our WHS students with a sliver of time during the school day when they can get some of their homework done, accomplish the work [of] their clubs, and even get in some exercise or meditation-type activities. 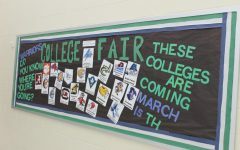 We know that our [Weddington High School] students are very busy outside of school, so we believe that this may provide an opportunity to enhance their ability to manage the balance of school, extra-curricular activities, jobs, etc.”. So while change often does bring speculation and uncertainty, it can also bring improvement and strength, especially through the collaboration of students and staff. With Warrior Block to start the week of September 10th, it will be compelling to see the benefits of this change and witness the overall outcome.